In pharmaceutical chemistry, one of the requirements for method validation is accuracy, the ability of an analytical method to obtain a value of a measurement that is close to the true value. There are several ways of assessing an analytical method for accuracy. Compare the value from your analytical method with an established or reference method. Use your analytical method to obtain a measurement from a sample with a known quantity (i.e. a reference material), and compare the measured value with the true value. If you don’t have a reference material for the second way, you can make your own by spiking a blank matrix with a measured quantity of the analyte. If your matrix may interfere with the analytical signal, then you cannot spike a blank matrix as described in the third way. Instead, spike your sample with an known quantity of the standard. I elaborate on this in a separate tutorial on standard addition, a common technique in analytical chemistry for determining the quantity of a substance when matrix interference exists. Standard addition is an example of the second way of assessing accuracy as I mentioned above. 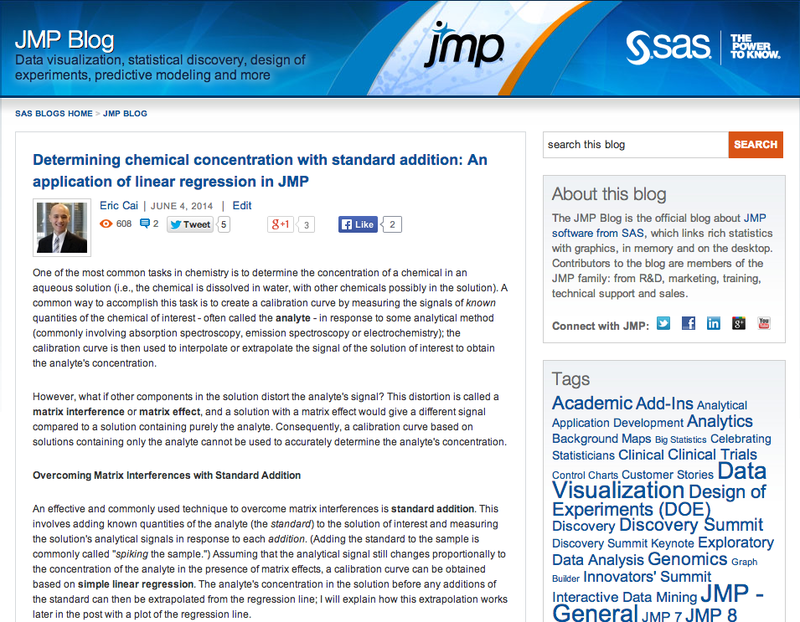 You can view the original post of this tutorial on the official JMP blog.